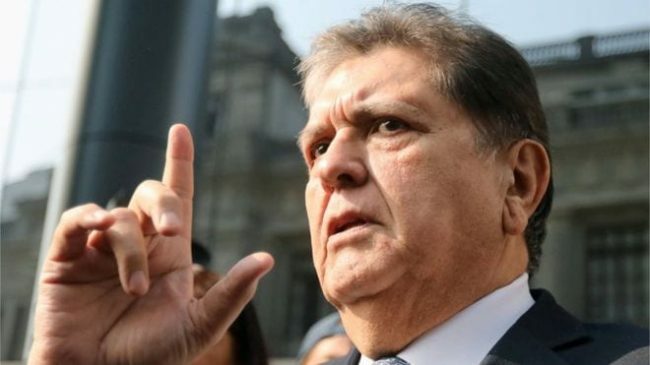 The former president of Peru, Alan Garcia shot himself in the head, committing suicide on April 17, 2019, prior to police arresting him on corruption charges. He was 69 years old. President Martin Vizcarra confirmed his death over Twitter by saying that he was devastated by the sudden death of Garcia, and he sent his condolences to his loved ones and family. The interior minister, Carlos Morán, said on TV Peru, police arrived at 6:30 am GMT-5 to arrest Garcia on a warrant. After police entered the home, Garcia requested that his attorney be called. He went to his bedroom and police heard a gunshot. When officers forced themselves into the bedroom, they found Garcia with a gunshot wound to his head. Garcia was rushed to a Casimiro Ulloa hospital in Lima, in very grave condition. The ministry of health said Garcia had an entry wound and exit in his head. Garcia, the leader of the Aprista Party, served as president of Peru twice from 1985 to 1990 and he returned in 2006 to 2011. He was under investigation for bribery and receiving payments which were illegal from the construction company Odebrecht. In Nov. 2018, a court in Peru barred the former president from leaving Peru.